Some museums take hours to enjoy. Some take five minutes. 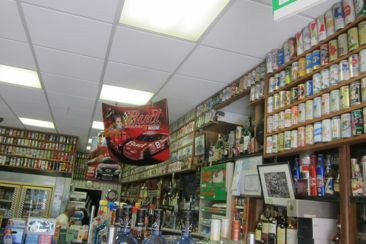 The Beer Can Museum, located along the upper walls of the Highland Package Store in the Town Plot section of Waterbury would be the latter. Before I delve into my amazing experience at this museum, I must apologize for not having any background info on the place. I totally forget where I learned about this one, but it was probably in late 2013 and it was online. I have a link saved, but it’s a dead link and I can’t seem to find anything else about it online. And that stinks, because I was pretty much relying on the info contained in that now-dead link to give us all some background information on this place. 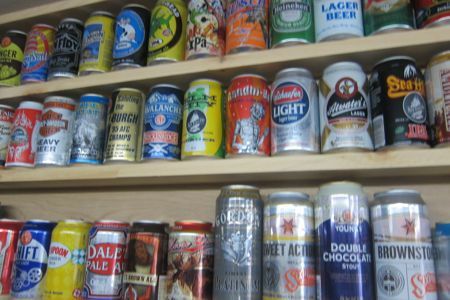 2019 Update: They have a website that now has this on it: One of a kind Beer can museum featuring over 3,000 beer cans dating as far back as 1935! Awesome. You’d think I’d chat up the proprietors and talk about the genesis of the collection and why and when they decided to call it a museum. You’d think that I, as beer drinker would be fascinated with the collection and have all sorts of interesting and probing questions about the museum. I was in a hurry, yes, but I also usually operate on the down low for these sorts of missions. This comes as a surprise to many readers, I know, but it’s just the way I am. So on my way out to the grand opening of the OEC Brewery out in Oxford, I swung off of I-84 into western Waterbury and checked out the museum. The store itself is nothing special at all. The beer selection is pretty weak and I didn’t see many local breweries on offer at all. The one other customer during my visit picked up a Bud Light case and mentioned something about how he and his boys were going to get drunk later that day. And thus ended my interaction with the creators and maintainers of the Beer Can Museum of Waterbury, Connecticut. 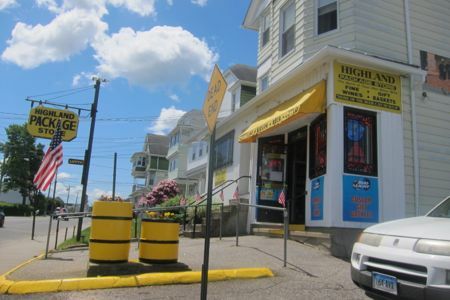 I did find another person’s experience up on the hill in Waterbury online… One which makes me laugh in light of my taking pictures inside the store. This woman is a photographer and her flickr photostream is a collection of storefronts. 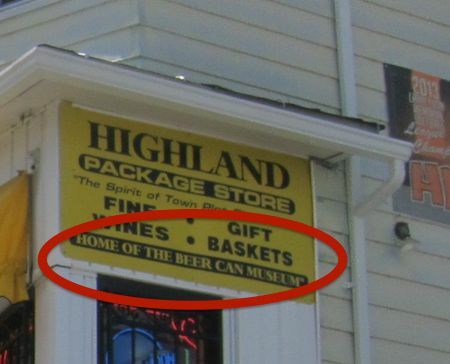 She took a picture of the front of the Highland Package Store, here. 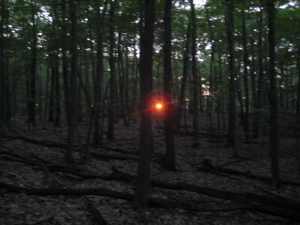 I took this while I was out for a walk on Saturday. As I continued on, the owner of the store came out, clearly not happy, and asked, “You taking pictures of my store?” He asked why and I told him and he went back inside. I somehow avoided that uncomfortable situation. 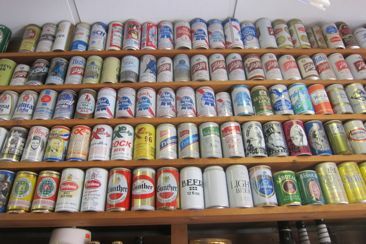 There are a lot of empty (presumably) beer cans here at the Highland Package Store Beer Can Museum. Lots of old ones too, and I assume several have interesting backstories. Funny that, of the thousands of cans here, I was first drawn to the ol’ Gandhi Bot in the back room. The Power of the Bot is strong. And let’s be honest, there are tons of bars and breweries around the country with extensive beer can collections. 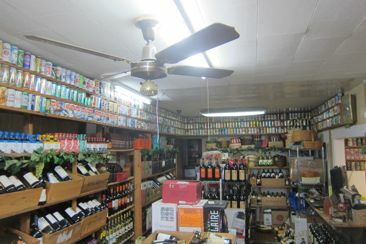 But hey, the guy(s) at Highland Package Store put the word museum on their sign, so here I am. They seem to have exhausted all the wall space for their museum. It was very well organized and presented neatly and I would bet that the guy who set it up probably knows pretty much what he has and where it resides. So I wonder if he frets about the fact that so many craft breweries are moving towards canning. Sorry this page is kind of stupid. 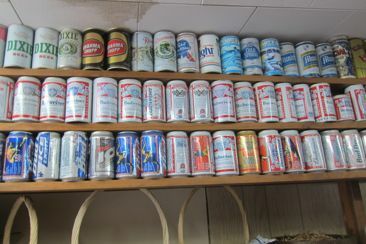 But then again, what more could I really say about a dusty collection of old beer cans anyway?